Hi Sachinists.. here is the speech given by Sachin Tendulkar on last match of his career..
"Cricket is oxygen for me. Its hard to live without Cricket! "All my friends, settle down let me talk, I'll get more and more emotional." The crowd does berserk out there. "My life between 22 yards in the 24 years, it's hard to believe that it's coming to an end. I would like to thank all the people who have helped me in my life to get here. I have a list in my hand, please forgive me if I miss out on a few names. First, my father, he passed away in 1999. He was very key for my career. He gave me freedom, chase your dreams and don't find shortcuts. He also told me to be a nice human being. My mother, I don't how she dealt with such a naughty like guy me. She took care of me to be healthy. She started praying for me even before I started my career and I think those prayers gave my strength. In my school days, I used to stay with my uncle and aunt as my school was far away. They treated me like their son. My eldest brother, he used to tell me, I know you'd do everything right and I have the confidence in you. My sister, she gave my the first bat for me. A Kashmir Willow bat. She continues to fast when I bat. Ajit, I don't what do I talk about him. It all started from the age of 11, he took to Achrekar sir my coach. And my life changed. Even last night, he called me and we were discussing my dismissal. Various things we agreed upon, my technique. I have had a lot of chat with him. If I had not done that, I would have been a lesser cricketer. The most important one in 1991, I met my wife Anjali. I know she was a doctor. When we decided to make it a family, she said, you continue with your cricket and I'll take care of the family. Without that I think I couldn't have played so much cricket. Thank you for all that you've done and it is the best partnership I've had in my life. Then Sara and Arjun are two precious diamonds in my life." "I was extremely happy to see (coach) Ramakant Achrekar in the stands, normally he watches on TV. Sir would take me all over Mumbai on his scooter to play two matches and get match practice. He has never told me 'well played' and maybe now he can say that as there is no more cricket in my life." "Time has flown by rather quickly but the memories that you have left will always be with me, specially 'Sachin... Sachin...' will reverberate in my head." 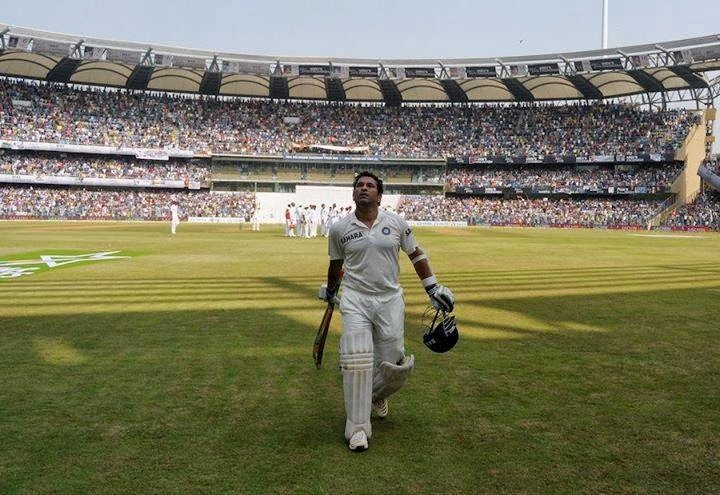 "This is the biggest match in the cricketing histroy and thank you Sachin for all that you've done. We won't see this again," Indian skipper MS Dhoni. "We're honoured to play against Sachin Tendulkar in his historical and final Test match," West Indies skipper Darren Sammy said. Sachin Tendulkar gets a Special Award by the Sri Lankan government.